Building A Village Starts With Building The Tractor Do-it-yourselfers have made everything from bamboo bicycles to 3-D printers, but nothing as ambitious as the Open Source Ecology project. On a farm in northwest Missouri, tractors and other industrial machines are made from scratch, with detailed plans on how to do it yourself shared online. Designed and built on Marcin Jakubowski's farm, this tractor cost far less than a commercial tractor. Do-it-yourselfers have made everything from bamboo bicycles to 3-D printers, but nothing as ambitious as what's happening on a farm in northwest Missouri where tractors and other industrial machines are being made from scratch. Physicist Marcin Jakubowski leads the Open Source Ecology project, which aims to design and build affordable alternatives to industrial machines. Marcin Jakubowski earned a Ph.D. in physics, and his doctoral thesis deals with velocity turbulence and zonal flow detection, whatever that is. But when Jakubowski graduated in 2004, he wanted nothing to do with physics or academia. "I was so disillusioned and disenchanted with that whole world, I wanted to leave it as soon as possible," says the 39-year-old Jakubowski. "So the first thing I did after graduation is settle on some land and started getting dirty." Jakubowski moved to Missouri, where he eventually bought 30 acres in the town of Maysville. He grew wheat, raised goats and tended a fruit orchard. But then one day, his tractor broke. "I came from an institution of higher learning, so I had no practical skills," he says. "I picked up a welder and a torch and started using it." Jakubowski actually made a tractor from scratch, using square steel tubing that he bolted together. "A tractor is basically a solid box with wheels, each with a hydraulic motor," he says. "So, conceptually, it's actually very simple. And when I first did it, it was like, 'Wow, a tractor' ... I was amazed to find this actually works." Jakubowski says the experience of making his own tractor transformed him and he set about designing and building affordable alternatives to industrial machines. The documentation and design is made available for free online as part of his Open Source Ecology project. Jakubowski plans to prototype several dozen machines, including a wind turbine, cement mixer and sawmill. He refers to them collectively as the Global Village Construction Set. Last year, Jakubowski was named a TED Fellow by TED, the non-profit foundation that gathers innovators from the worlds of technology, entertainment and design. Videos of the TED Fellow talks are popular on the Web and Jakubowski's is no exception. 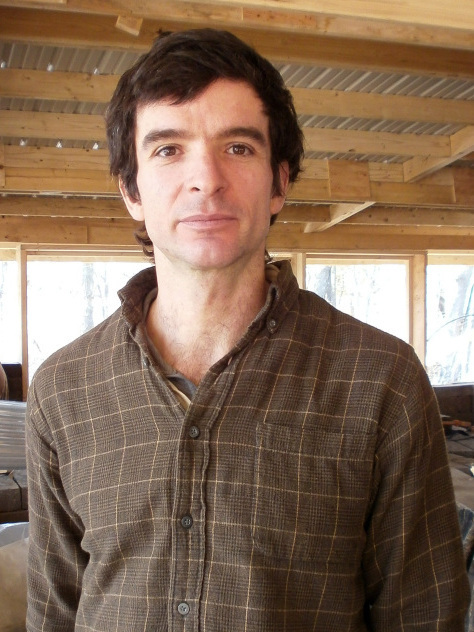 Subtitles for his video have been translated into 41 languages and has drawn kindred spirits to the farm in Missouri. "I believe that the heart of economic democracy is decentralized productive power spread throughout the populace," says 18-year-old Yoonseo Kang from Mississauga, Ontario. A robotics wiz in high school, Kang decided to forgo college and instead move to Jakubowski's farm, where he's working on a machine that mills printed circuit boards. 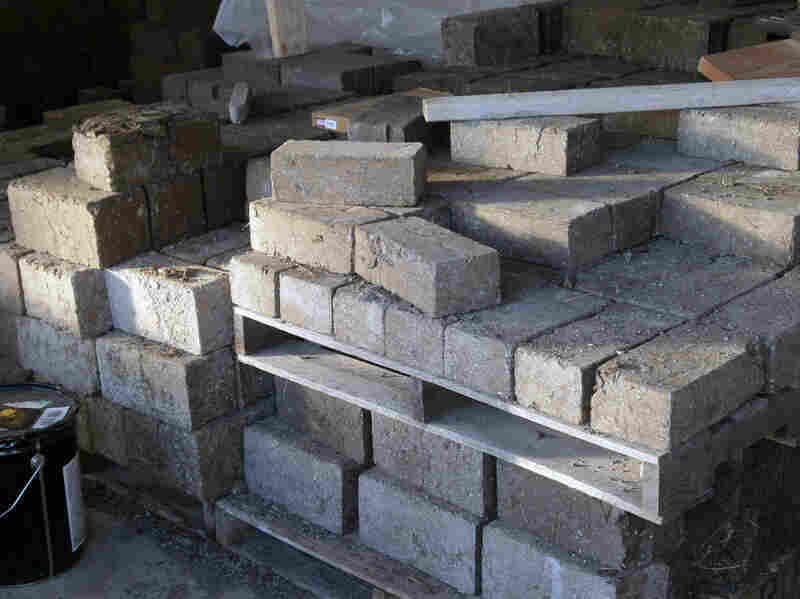 These bricks were made in one of the earth brick presses created by the Open Source Ecology project. Briana Kufa, 20, of San Diego, is a certified welder who's been studying architectural engineering in college. Kufa came to the farm to build something called a compressed earth brick press, which churns out bricks made from dirt on site. She built four of them. "It's a lot of cutting, a lot of welding, a lot of torching and that's basically all the skills you would need to make one of these," Kufa says. "I could probably teach someone how to do those things in a day." Commercially manufactured earth brick presses sell for tens of thousands of dollars, but Jakubowski says his open source version can be built for about $4,000 in parts. There is extensive documentation online, including a step-by-step assembly video. Some of the compressed earth brick presses made at the Open Source Ecology farm have been sold to people who will build homes with them. In Cedar Creek, Texas, a compressed earth brick press was built from scratch by Creation Flame, a spiritual group. "I saw [Jakubowski's] TED Talk back in May and it was like, finally, for the first time in my life I knew what I had to do," says James Slade, who helped put the press together. "It was like, I'm on a mission from God. I have to do this." It took Slade weeks last summer to replicate the compressed earth brick press but he says that when the first bricks rolled out, it was like giving birth. "I come from the software world. I didn't know how to weld. I hadn't had much machining experience," he says. "You know, it took some learning. We made some errors, but if I can do it, just about anybody can do it." 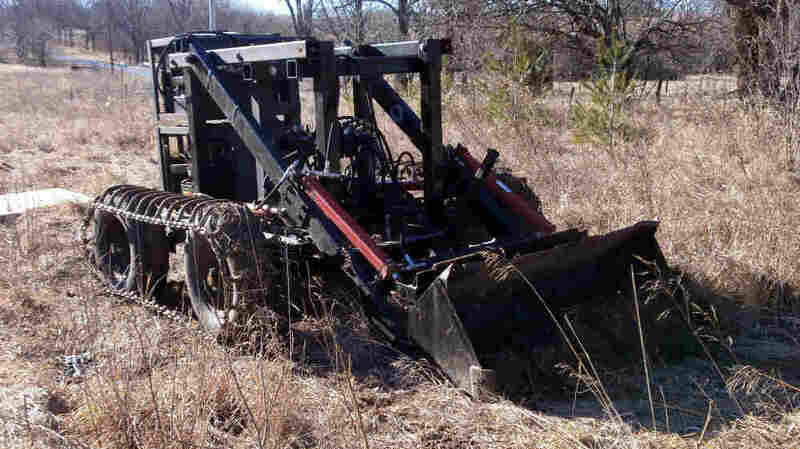 One of Jakubowski's colleagues in the TED Fellows program is planning to use the open source earth brick press and tractor to build a village for displaced Guatemalans. Back at the Open Source Ecology farm in Missouri, construction is proceeding on a dormitory for visitors and a large fabrication facility. Both are being made with earth bricks. The expansion is being fueled by a successful Kickstarter fundraising campaign, a foundation grant and a six-figure fellowship for Jakubowski, who expects to hire a farmer and production manager this spring. Jon Kalish is a Manhattan-based radio reporter and podcast producer. For links to radio docs, podcasts & DIY stories, visit http://jonkalish.tumblr.com.